Yankee Supply has been providing our customers with warehouse and material handling equipment for more than 35 years. Because of our proven track record and dedication to client satisfaction, we are the perfect choice for anyone searching for a new or used conveyor. The belt option is usually used to handle packages, small parts, and other raw material. It typically operates on a decline or incline, but can also transport objects horizontally. Local grocery store check-out counters utilize this type of belt system. The least expensive type, the gravity conveyor, is non-powered and is commonly used to offload trucks and to sort packages. The roller is also used for handling light to medium packages. It can even be used for handling heavier items like pallets and drums. The skatewheel system features a smoother transport than some of the other choices. This makes it perfect for lightweight packages. One of the most unique types is the ball transfer option. Ball transfer tables can move and rotate products in any direction. This particular system allows products to be moved around curves. 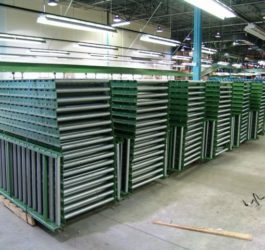 If you are in need of equipment and are looking to save money, try our selection of used conveyors. Our equipment is clean, well-maintained, and in excellent working condition. If you have recently closed a facility, are looking to downsize, or need to upgrade your current machinery, we would love to purchase them from you for resale. If you have any questions or inquiries, don’t hesitate to give us a call. Check out our comprehensive equipment catalog to view more of our products.